Our doctors have joined a growing number of high tech chiropractic doctors that have upgraded their level of care to better assess the health and well being of their community. People can now be examined by the Insight Subluxation StationTM, a non-invasive technology which is a neuro-spinal screening and evaluation system originally designed to measure changes in the spinal muscles of astronauts caused by space flight. It is painless, economical, and only takes minutes. Our doctors use the InsightTM technology to help measure subluxations, which is a nerve interference along the spine. This nerve interference disturbs the muscles regular nerve function, causing an abnormal amount of electrical flow to the muscles and create other health problems. 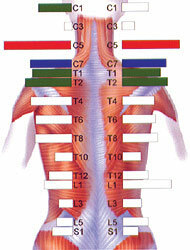 The Insight Subluxation StationTM measures the electrical flow and charts it, using graphics that show the spine. This helps specify precisely when chiropractors should adjust their patients, allowing for increased accuracy in diagnosis, treatment, and outcomes. The InsightTM technology used by our doctors has received the highly regarded, exclusive recognition of a Certified Space TechnologyTM from The Space Foundation, in cooperation with NASA. “We are extremely excited to be able to bring this breakthrough technology to our office and patients,” states Dr. Griffin. To have an evaluation with the Insight Subluxation Station, contact today.